Barnet raced into a first-half lead courtesy of goals from Simeon Akinola and Josh Walker. Hampton had a string of chances to get back into the game in the second period but failed to find the net. Gary McCann named seven changes to the side that beat Dulwich Hamlet on Saturday with just Tom Lovelock, Sam Cox, Oliver Sprague and Richard Orlu retaining their places. Among the incoming players was midfielder Sergio Munesio who made his Beavers debut. After a quiet opening ten minutes, Barnet’s Akinola recorded the first chance of the game when he let fly from 25 yards but his effort sailed well over the bar. Beavers then responded with a well-worked corner delivered by Zak Joseph towards the head of Orlu. The defender towered above the Bees’ defence but directed it just wide. The hosts took the lead on the 18th minute when Mohamed Bettamer slotted the ball into the path of Akinola who needed no first touch before squeezing the ball past Lovelock and into the side-netting from a tight angle. 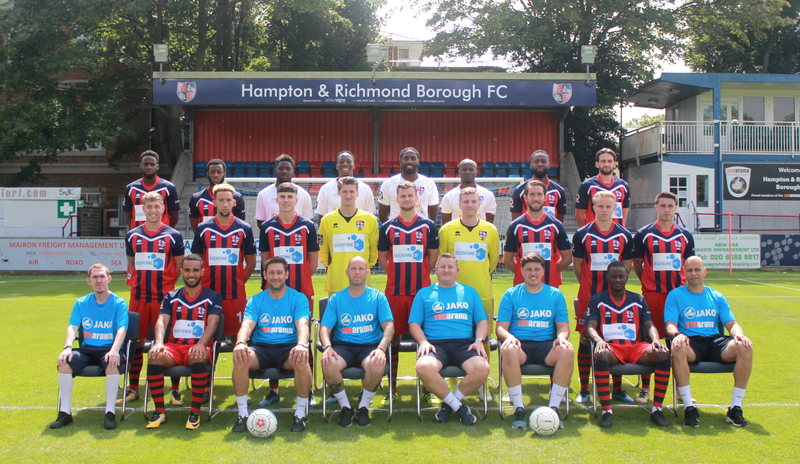 Hampton played their way back into the game and had a good chance to level the scores on the half-hour mark when Ryan Hill tricked his way past the Barnet defence before finding Karl Oliyide, who saw his close-range shot deflected wide. The visitors then went event closer after Hill delivered a low cross into Dylan Randall whose shot was blocked before Ricky Wellard’s follow-up suffered the same fate. Beavers had a further opportunity soon later when Orlu headed wide after Joseph had whipped the ball in from a corner. But the Beavers were soon made to rue their missed chances when the hosts doubled their lead on the brink of half-time. Dan Sparkes’ volley was saved by Lovelock, but the Beavers’ keeper could only parry the ball to Walker who tapped the ball into an empty net. At the interval, Hampton made two changes as they looked to find a way back into the game with Craig Dundas and Matty Whichelow entering the fray. Hampton continued to probe the Bees’ defence in the opening stages of the second half and went close when Joseph fired over as he moved through on goal. Munesio then let fire from 30 yards soon later, but his testing effort was palmed wide by Rihards Matrevics in the Barnet net. Beavers thought they deserved a penalty on the 67th minute when Joseph was tugged down in the Bees’ box but referee Daniel Simpson waved away the visitors’ protests. Minutes later, Sprague nearly pulled one back for the Beavers when his curling free-kick clipped the crossbar after dipping over the wall. Hill then found himself through on after neatly controlling a lofted ball. The winger ran at goal from an acute angle but his rising shot was tipped out for a corner by Matrevics. Hampton’s final effort on goal came from Whichelow who latched on to a loose ball on the edge of the box but could only blaze it over the bar as Barnet held on to progress to the semi-finals.